Wax tarts from the CFTKR basket that I would buy again in a heartbeat: Serendipity Marshmallow Delight, Merlin's Forest, Cedar Sage and Blackberry, Bayberry Black Forest, Fig and Cassis, Apple Cobbler Delight, and Celtic Moonspice. I would also repurchase the CLK's Warm Winter Vanilla Sugar. This basket is made entirely of recently gifted wax from my friends Sunnee (Fragrance Obsessed) and Liz (Furianne). I am really excited to melt these, as they both gave me some amazing wax and I am so grateful. If you would like a melted review of any of these scents please let me know in the comments. Even though I am only one week into summer, I feel like I have been getting a lot done. We built our home in 2005 and chose pretty basic options: linoleum, cheap carpet, white walls. About the only thing we upgraded were the cabinets and knock down ceilings. Little by little we have been updating our ten year old home. 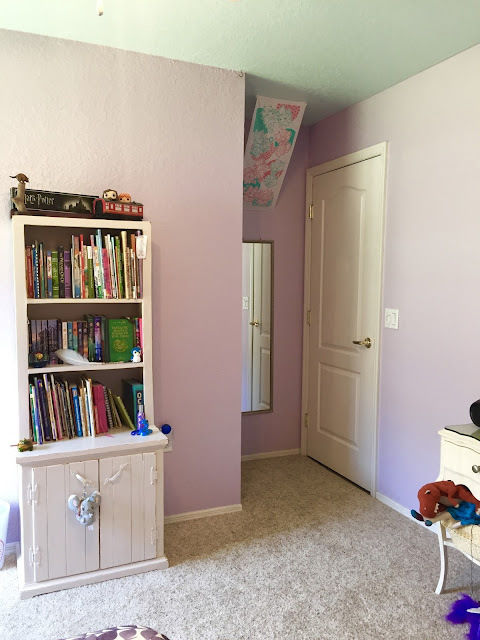 A few years ago we had laminate flooring installed, last year it was tile in the bathrooms and new toilets, this year it was new carpet in the bedrooms and painting. 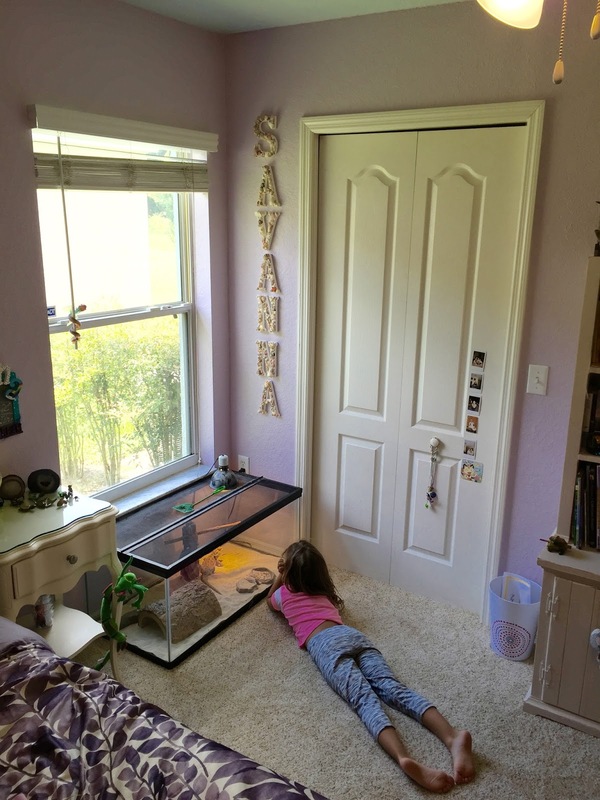 I started with Savanna's room. She was ready to be rid of the blue seashell room (I did some scallops, starfish and bubbles on one wall when she was a toddler). We bought her a new full size bed and let her pick the bedding (that was in the clearance section of Sears- only $37 for her set, it was 75% off) and her bedroom color. She went with Dusky Violet (Lavender?). The bookcase had to be repainted. It belonged to my great grandmother, Granny Conrad. 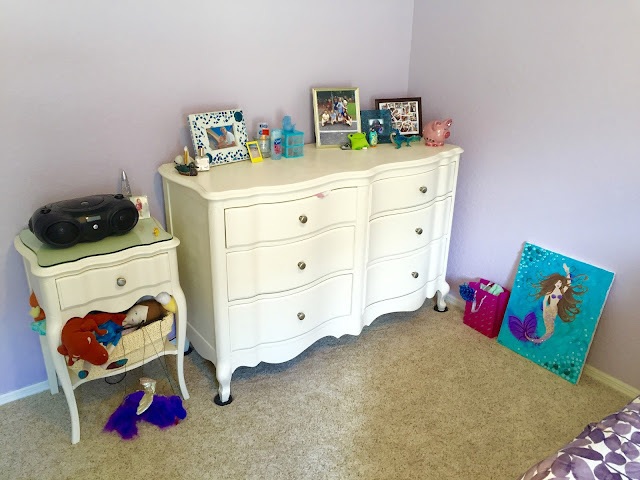 The dresser and nightstands needed to be repainted too. These were a hand-me-down from Adam's close friend. His ex-girlfriend moved out and left them behind. I was more than happy to give them a home. The walls are pretty bare right now. I am going to paint her a few paintings on canvas, she wants Fawkes and Harry Potter catching a snitch, and then string up some fairy lights on some hooks from her ceiling. Beardie lives on the floor now instead of on her dresser. She had a hard time reaching him up there so I figured this would work better. Scarlette was lizard gazing. She doesn't have a headboard, but we will probably keep it that way. There are just so many other things we need to update and a headboard is not necessary for us. I finished painting the guest bathroom. It was in browns with a faux textured finish but now is a solid ice grey light blue shade. Right now I am gearing up to start painting Scarlette's bedroom, she chose teal. The master bedroom and bathroom, in a greenish grey, will be last. I love the gratification of seeing a room transformed in a just a couple days with new paint and refinished furniture. Do you have any home projects going? 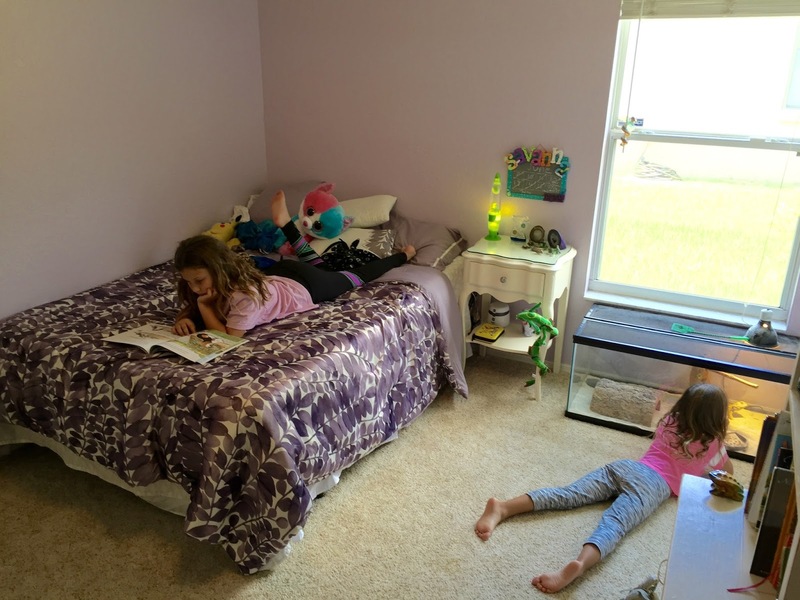 Are you interested in seeing Scarlette's room when it is done? I'm definitely interested in seeing Scarlette's room when it's done! My projects are much of the same things I've been working on since we've moved in: getting the house decluttered and organized. Besides that it's a bunch of Hanji projects that I've been working on. I also want to buy some plants for our larger porch and get the porch cleaned up, but that'll have to wait until I've picked up a face mask. I'm not cleaning up all that pollen from Spring without some protection! OH! Wax review requests: Glitterati Cotton Candy Strawberry, RG Twilight Woods November Rain and Whiskers on Kittens. Oh good! And thank you for these yummy smellies. Plants! Yes! Taking out some old yucky plants and getting new edging and re-mulching is on our list too. I love plants. I just wish they loved me. I am enjoying reading about your Hanji projects. Have you placed your Glitterati custom order yet?? I LOVE Whiskers on Kittens on cold. I will be more than happy to review them!